Function object to set bits. The base class for fingerprints. These fingerprints are condensed representation of molecules (or other objects) as a list of boolean values (actually bits in a vector<unsigned>) with length of a power of 2. The main motivation is for fast searching of data sources containing large numbers of molecules (up to several million). 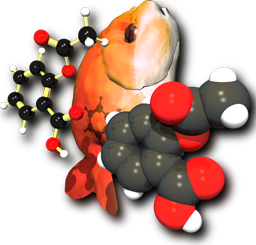 Open Babel provides some routines which can search text files containing lists of molecules in any format. See the documentation on the class FastSearch. Many methods of preparing fingerprints have been described, but the type supported currently in OpenBabel has each bit representing a substructure (or other molecular property). If a substructure is present in the molecule, then a particular bit is set to 1. But because the hashing method may also map other substructures to the same bit, a match does not guarantee that a particular substructure is present; there may be false positives. However, with proper design, a large fraction of irrelevant molecules in a data set can be eliminated in a fast search with boolean methods on the fingerprints. It then becomes feasible to make a definitive substructure search by conventional methods on this reduced list even if it is slow. OpenBabel provides a framework for applying new types of fingerprints without changing any existing code. They are derived from OBFingerprint and the source file is just compiled with the rest of OpenBabel. Alternatively, they can be separately compiled as a DLL or shared library and discovered when OpenBabel runs. Fingerprints derived from this abstract base class OBFingerprint can be for any object derived from OBBase (not just for OBMol). Each derived class provides an ID as a string and OBFingerprint keeps a map of these to provides a pointer to the class when requested in FindFingerprint. Declare a global instance with the ID you will use in -f options to specify its use. Fingerprints are handled as vector<unsigned int> so that the number of bits in this vector and their order will be platform and compiler dependent, because of size of int types and endian differences. Use fingerprints (and fastsearch indexes containing them) only for comparing with other fingerprints prepared on the same machine. The FingerprintFormat class is an output format which displays fingerprints as hexadecimal. When multiple molecules are supplied it will calculate the Tanimoto coefficient from the first molecule to each of the others. It also shows whether the first molecule is a possible substructure to all the others, i.e. whether all the bits set in the fingerprint for the first molecule are set in the fingerprint of the others. To display hexadecimal information when multiple molecules are provided it is necessay to use the -xh option. To see a list of available format types, type babel -F on the command line. The -xF option of the FingerprintFormat class also provides this output, but due to a quirk in the way the program works, it is necessary to have a valid input molecule for this option to work. Repeatedly ORs the top half with the bottom half until no smaller than nbits. Referenced by FastSearchIndexer::Add(), FastSearch::Find(), FastSearch::FindMatch(), and FastSearch::FindSimilar(). Referenced by FastSearchIndexer::FastSearchIndexer(), and FastSearchIndexer::~FastSearchIndexer(). Inline version of Tanimoto() taking a pointer for the second vector. Referenced by FastSearchIndexer::FastSearchIndexer(), FastSearch::Find(), FastSearch::FindMatch(), FastSearch::FindSimilar(), OBFingerprint::Fold(), OBFingerprint::GetBit(), and OBFingerprint::SetBit(). For backward compatibility; a synonym of OBFingerprint::FindType. Generated on Tue Feb 28 2012 07:00:06 by 1.7.0.